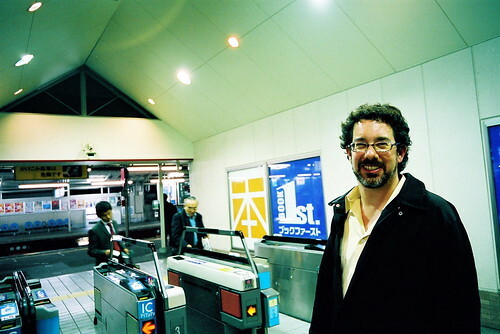 Adam Frank studies avant-garde poetry and teaches at the University of British Columbia, and he recently came to Japan to give a presentation at the World Forum for Acoustic Ecology. According to the WFAE website, “Our members represent a multi-disciplinary spectrum of individuals engaged in the study of the social, cultural and ecological aspects of the sonic environment.” Since Adam is interested in soundscapes, and in librettos, a visit to the Takarazuka Revue seemed like an obvious choice. I had gone one time before and seen Rome at Dawn, a rock-opera reinterpretation of Julius Caesar that was mind-blowingly, excitingly, weird and great. The dramatic portion of the event this time was Sketches From the Life of Ryoma Sakamoto, a historical drama based on Ryoma’s life, and his role in the overthrow of the Tokugawa Shogunate. Unfortunately, the play (which was Part 3 of an I-don’t-know-how-many-parts production), really did follow the form of historical drama, which meant lots of exposition, an incredibly large cast of characters that were difficult to keep track of, and not nearly as many magisterial song-and-dance bonanzas as in Rome at Dawn. There were several magnificent set pieces — fantastic bon-odori fan dances at the beginning and end of the play, a kind of festival street scene in which local Osakans celebrate the arrival of American ships, and a crazy action sequence where Ryoma fends off attacking samurai with his guns while surrounded by about 40 ‘European’ women in huge, bright yellow dresses — and there was the usual Takarazuka gender-bending humor as well — Ryoma escapes from a dangerous situation by dressing as an awkward geisha and one of the women enthralled by Ryoma disguises herself as a samurai in order to collect information on Ryoma — but this didn’t make up for the lengthy exposition, which made the play much more of a play and much less of a spectacle than Adam and I were anticipating. The fact that my Japanese is not great, and Adam doesn’t speak any Japanese at all, certainly didn’t help. In stark contrast, a student of mine who saw the same performance absolutely loved the historical components of the play. Luckily for Adam and I, the song-and-dance portion of the performance turned out to be magnificently over the top. The title of this portion of the show was The Classical Music — I Love Chopin, and it turned out to be a glorious, and rather hallucinogenic, romp through the most pompostuous, florid, and extravagant fantasies about classical music that can possibly be imagined. What does classical music mean? Of course it means butlers, ritzy parties, ballet, castles, Romeo and Juliet, tortured and dying artists (so Romantic!) , young girls in tutus, massive amounts of sequins and huge, brightly-colored ostrich feathers, and, of course, opium. All of the popular tropes of European high culture pranced themselves out onto the stage and exploded in a kind of spectacular and unimaginable glory. Here were some of the high points: 1) The opium-addicted musician who is surrounded by prancing poppy-girls wearing bright orange, green, and yellow outfits that look straight out of Dr. Seuss. They each have a single flower sprouting out of their heads, and the musician’s wife enters from time to time to scold him and try to chase the prancers away. 2) A Romeo and Juliet sequence that takes place in a castle at night and involves a shoot-out between Sharks and Jets who are dressed in leather outfits that are straight out of Michael Jackson’s Thriller. 3) A wild upper-class wine party (straight from the 30s?) that ends with outrageous fireworks that turn into a snowfall. Somehow the party disappears and leaves us with this: “Snow Singer (man) and Snow Singer (woman) sing under the falling snow. Classical ballet dancers in white tutus come on stage and dance an elegant classical ballet.” 4) Suits of armor come to life, which somehow leads into a dance routine featuring dozens of young girls wearing bright, bright, bright tutus. 5) “Chopin stands before a white piano in the middle of the stage under the starry sky. Destiny appears and seduces Chopin into the Empire of Death.” 6) Of course the finale is an incredible song-and-dance number in which all of the performers parade down a grand staircase wearing purple Vegas-style outfits with enormous feather accoutrements that increase with size in direct relation to a particular performer’s star power. Incredible. I remember that at one point in the middle of all of this Adam simply turned to me and said, “This is insane.” And that’s precisely what is so amazing about the Takarazuka Revue — when it’s successful it pulls you entirely into its visual and aesthetic world and you are transported. The rapid stage transformations, the spectacular costume changes, the vertiginous mixing and matching of styles and references — all of this adds up to an effect that’s similar to that of drugs: you’re taken out of your mind and put into a strange world-space that you couldn’t have possible imagined before entering it, and that you can’t quite remember once you’ve left. Back Away: A Rural Opera in seven parts, takes place outside a medium-sized midwestern town in the United States, at the turn of both the nineteenth and twentieth centuries. It has five voices: Ike the narrator, who finds himself in an insane asylum at the beginning of the opera; two fat men, who have worked together as guards at the asylum for many years; and Millicent and Candace, two characters who Ike has created. Ike does not know why he has been committed, but he does feel that he is not “systematized,” that is, he feels either like he ought to have or he ought to be a “system.” He has a couple of basic questions: What is a system? and, Where can I get one? Some cities give you a second skin when they’re old. All told that’s true it’s true they do. Adam’s new project is called Overpass! A Melodrama. Also a collaboration with Shalabi, the CD will be released sometime in February or March on the Alien8 label, which is also home to Masonna, Acid Mothers Temple, Keiji Haino, and Shalabi Effect. I can’t wait!